The Mugen MDR wheel was designed specifically for the 2016+ CR-V. Measuring 19x7.5 with a +43mm offset, this cast wheel is beautifully constructed. With robust good looks, the Mugen MDR wheel is the perfect compliment for your CR-V. The Mugen MDC wheel is the perfect compliment for any 2016+ Civic. Measuring 19 x 8.5 with a +45mm offset this cast wheel is very strong and will add valuable tire contact patch for your Civic for better handling and braking. Beautifully constructed from carbon fiber, this easy to install Mugen front grill garnish will set your Civic part from the crowd. Comes complete with everything needed to mount. Give your 2016+ Civic 5D Hatch or Civic Type-R that Mugen touch with this unique Rear Tailgate Spoiler. Made from fiberglass reinforced plastic with carbon fiber panels. Comes will all mounting hardware and comprehensive installation instructions for easy installation. Give your 2016+ Civic 5D Hatch that Mugen touch with this unique Front Under Lip Spoiler Kit. Made from injection molded plastic for ultra-precise fit. Comes will all mounting hardware and comprehensive installation instructions. Give your 2016+ Civic 5D Hatch that Mugen touch with this unique Rear Under Spoiler Kit. Made from injection molded plastic for ultra-precise fit. Comes will all mounting hardware and comprehensive installation instructions. Give your 2016+ Civic 5D Hatch that Mugen touch with this unique Side Spoiler Set. Made from injection molded plastic for ultra-precise fit. Comes will all mounting hardware and comprehensive installation instructions. Give your 2016+ Civic 5D Hatch that Mugen touch with this unique Front Bumper Garnish set. Made from injection molded plastic for ultra-precise fit. Comes will all mounting hardware and comprehensive installation instructions. The Mugen Ventilated Visor set is a great addition to your 10th Gen Civic 5 Door hatch or Civic Type R! Easy and secure mounting with all installation parts included. The Mugen ventilated visors are not only stylish, but 100% functional in keeping wind noise to a minimum. Author and enthusiast Lionel Lucas chronicles the inception, birth and life of our beloved Type R's. Gorgeous color photography and well researched information contained in this 11" x 10" coffee table book make it a great read. This book should be considered a must for all Type R enthusiasts! Colorful MUGEN Commander Eye decal sheet. Great for windows, tool boxes, under your hood or on your laptop. 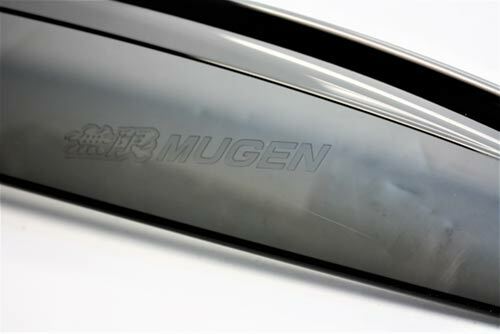 For the complete MUGEN enthusiast! Colorful MUGEN Commander Eye decal set. 2 decals per set. Colorful 4 piece MUGEN button set. For your favorite hat, shirt, lapel, sun visor- you name it! Designed to fit all Honda/Acura 5 speed manual cars, this MUGEN shift knob is the ultimate in hand crafted style. The perfect addition to any build is this MUGEN billet aluminum 6 speed shift knob. Designed to fit all Honda/Acura 6 speed manual cars, this MUGEN shift knob is the ultimate in hand crafted style. The perfect addition to any build is this MUGEN billet aluminum 5 speed shift knob. Luggage mat to prevent luggage area floor from getting dirty The same material as that used for the MUGEN sports mat is adopted to achieve higher durability MUGEN logo is embroidered. Available in two colors; "Black" or "Black x Red"